It seems like I have just got back from Australia, and tomorrow I leave for 5 weeks in beautiful California, so watch this space for some healthy, nutritious meals coming out of Kelly’s kitchen, where we will be cooking up a storm. 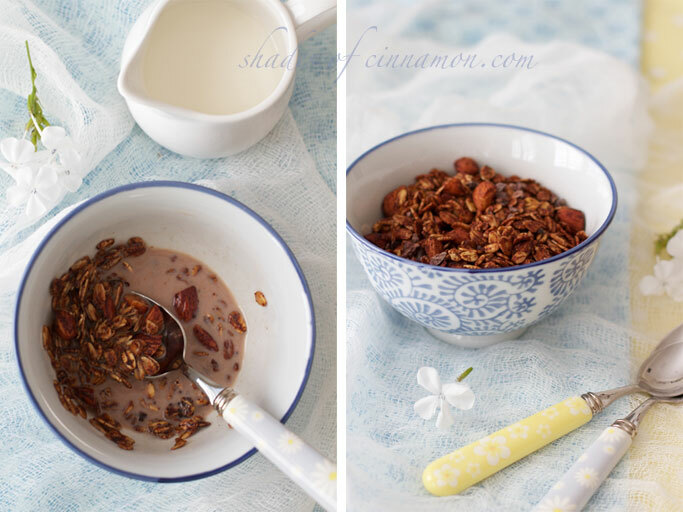 But before I leave, here is my new healthy granola recipe which is simple and quick to make. I have added all the goodness of raw cacao, organic rolled oats and nuts, making this chocolate granola super healthy and nutritious. 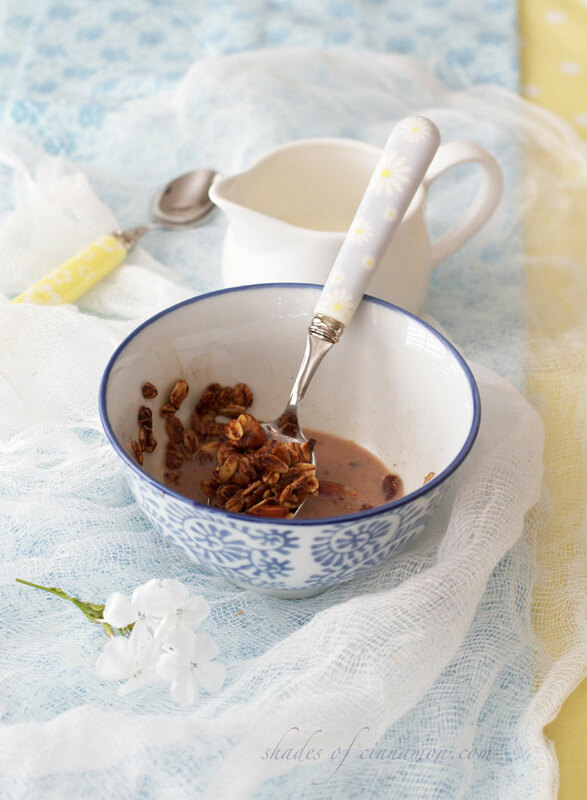 Serve this Healthy Cacao Granola in a bowl with cold milk or yoghurt, and add banana or berries for an energy boosting breakfast that is a healthy alternative to processed chocolate cereals found in the stores. I seem to be on a chocolate obsession at the moment. But I can’t get enough of this delicious organic cacao that I brought home from Australia. Cacao is not easily obtainable in South Africa, and it can be super pricey, so if you can’t find any, use cocoa powder, it is also highly nutritious. Read the packaging and make sure you buy dutch cocoa powder or one that does not have tons of added sugar. This is such a healthy breakfast option for the kids, they are going to love the taste, and so will you. When you add milk, the cacao seeps into it making a delicious chocolate milk that will entice them even more. Its also great for an afternoon sugar low fix, or an evening chocolate snack. 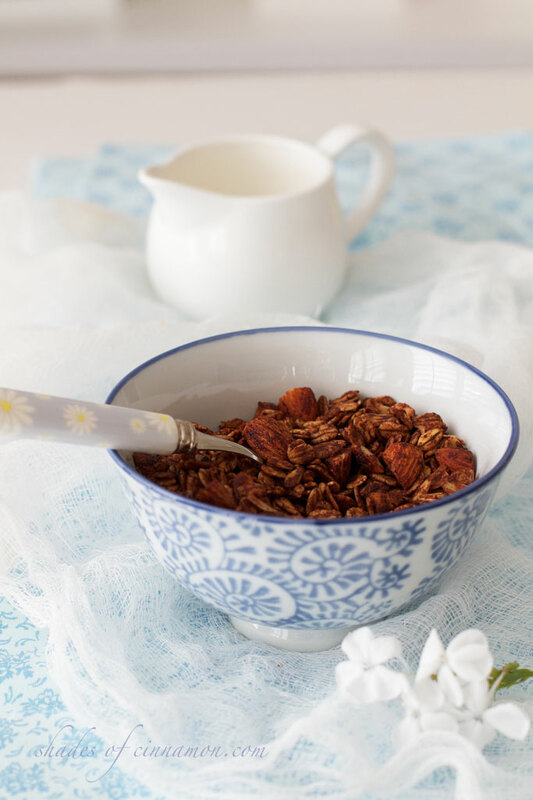 For another delicious granola try this Healthy Breakfast Granola overflowing with nutritious coconut, nuts, rolled oats, and cranberries. 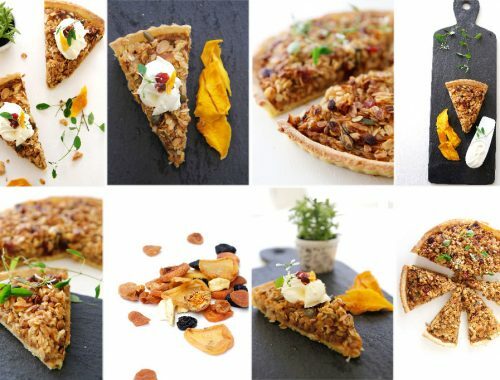 Or these great Breakfast Granola Cups filled with your favourite fruit and yoghurt. In a large baking tray mix the oats, cinnamon and almonds. In a saucepan melt the coconut oil and agave syrup/honey or golden syrup. Add the cacao powder dissolved in the hot water . Heat until all the ingredients are dissolved and smooth. Remove from the stove. Pour this mixture over the oats and stir until thoroughly coated. 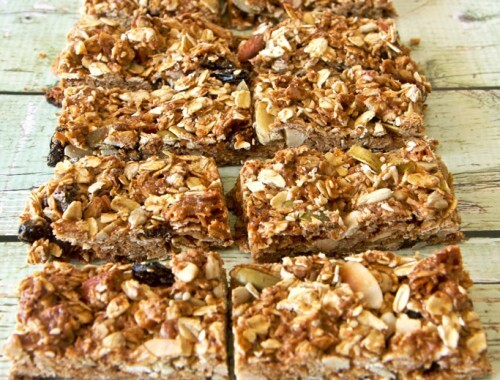 Spread granola in an even layer in the baking tray, and bake for approximately 20 minutes . Cool completely before adding the cacao nibs. Delicious with a splash of almond milk for breakfast or eat alone as a snack. 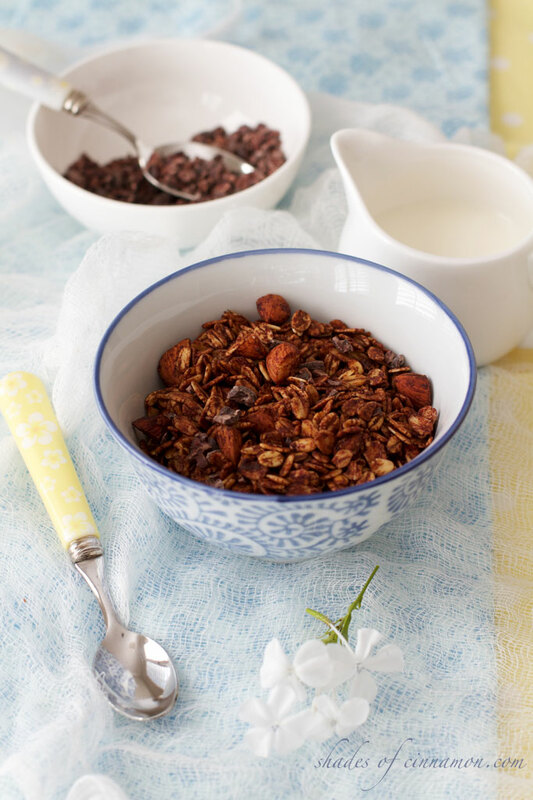 At home, we are ALL chocolate and granola lovers. This is a simple, yet delicious idea to start the day! Thanks for this, Ev! Yes, its a great combination, thanks for your comments Elizabeth. 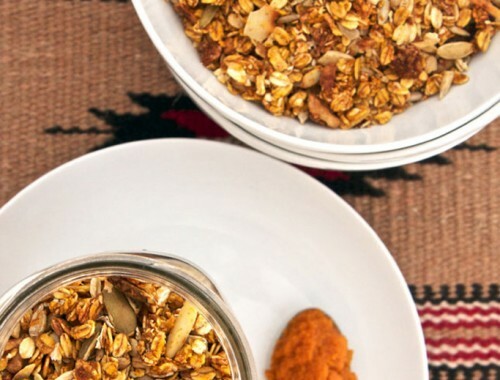 I loved your healthy breakfast granola and make it on a weekly basis so will most certainly try this one. I am salivating just looking at the pictures. Thanks for sharing yet another awesome recipe. Thanks Jenny, I hope you enjoy it as much as we do. 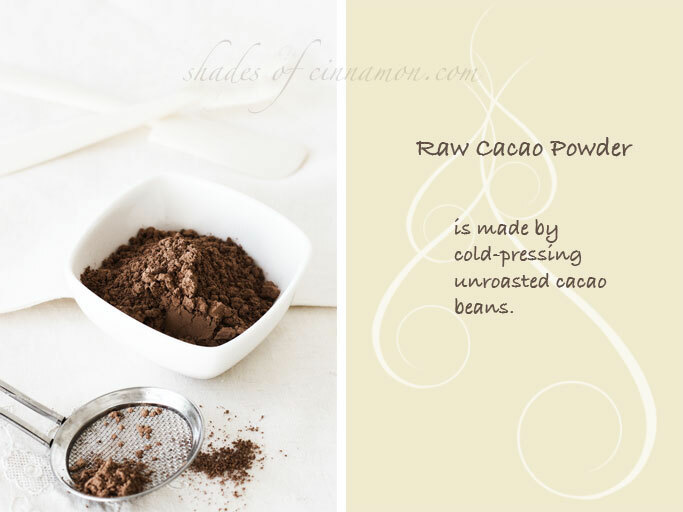 Hi Ev, the Health Shop at Flanders Mall has Organic Cacao Powder plus Cacao Butter. I sprinkled some over my muesli recipe but it was a little bitter. Reading your method, I would now mix it with the Coconut Oil first – will try it. Missing your chocolate treats. Have a wonderful time being a foodie in the States. Glad we have somewhere near that stocks that Joanie. 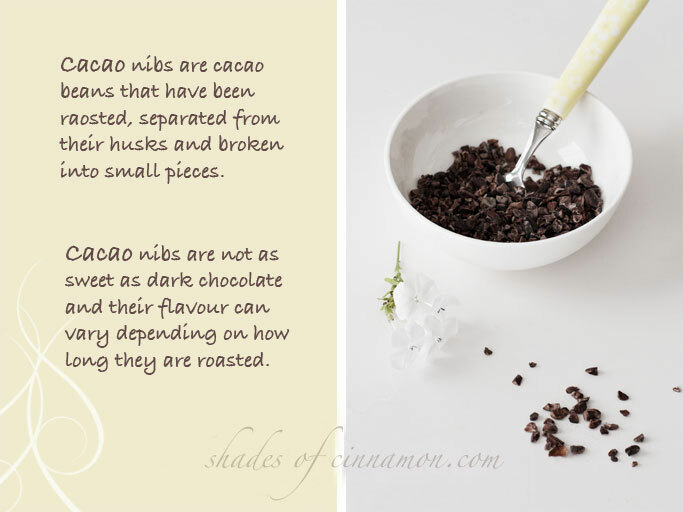 Cacao is very bitter thats why I like to add a little honey or agave, plus vanilla and cinnamon – cuts through the bitterness. Haven’t cooked a meal yet, I am being thoroughly spoilt with gourmet breakfasts from Brendon and delicious healthy dinners from Kel. Hi Ev, it’s so nice to have time to enjoy your beautiful posts again. My goodness these are quite amazing pictures, the colours are so delicate, the light is perfect, I have to say they are pure work of art. The recipe is very interesting and different too, I can’t wait to try. Where did you get those beautiful spoons from?